Nickname(s): "L.A.", "City of Angels", "Angeltown", "The Entertainment Capital of the World", "The Big Orange" "La-la-land", "Tinseltown", "City of Stars"
The Old Aliso, giant sycamore, historical symbol of Los Angeles. Government House, seat of the Asamblea when Los Angeles was the capital. Clocktower Courthouse, courtroom/theatre was on the upper floor, market was on the ground floor, and clocktower was on top, with copper dome. St. Athanasius' Episcopal Church, first Protestant church in Los Angeles, on Temple Road ("Salvation Alley"). Old stage road, to Cahuenga Valley & the back way to San Fernando. Approximate run of the original Los Angeles River bed, to current USC, through the former swamps of Leimert Park, and out to sea at Ballona Creek and Venice Beach. Los Angeles ( i/lɒs ˈændʒəlᵻs/, Spanish for "The Angels"), officially the City of Los Angeles and often known by its initials L.A., is the cultural, financial, and commercial center of Southern California. 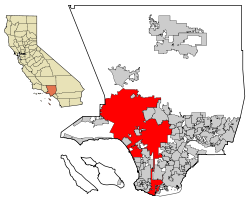 With a census-estimated 2015 population of 3,971,883, it is the second-most populous city in the United States (after New York City) and the most populous city in California. 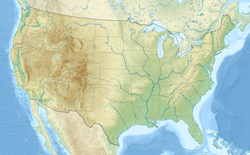 Located in a large coastal basin surrounded on three sides by mountains reaching up to and over 10,000 feet (3,000 m), Los Angeles covers an area of about 469 square miles (1,210 km2) The city is the focal point of the larger Los Angeles metropolitan area and the Greater Los Angeles Area region, which contain 13 million and over 18 million people, respectively, as of 2010[update], making it one of the most populous metropolitan areas in the world as well as the second-largest in the United States and the densest urban area in the United States. 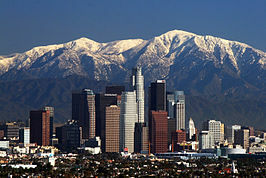 Los Angeles is also the seat of Los Angeles County, the most populated county in the United States. The city's inhabitants are referred to as Angelenos.